SAN FRANCISCO — In a sign that its television “hobby” has turned into serious business, Apple announced an aggressively-priced new set-top box that takes aim at the heart of the cable TV and DVD rental industries. The new Apple TV, which will go on sale at the end of September for $100, is a puny box just 1/4 the size of the previous model. It has an HDMI port, a power supply built in it, an optical audio port, an Ethernet jack, and built-in Wi-Fi. “It’s silent, cool and tiny,” said Apple CEO Steve Jobs, showing off the diminutive metallic box. Despite rumors, the product was not re-branded as “iTV.” Jobs did not state whether it was running a version of iOS, although the Apple TV’s new interface includes some very iOS-like touches, such as icons that jiggle when you are rearranging them in your Netflix queue. 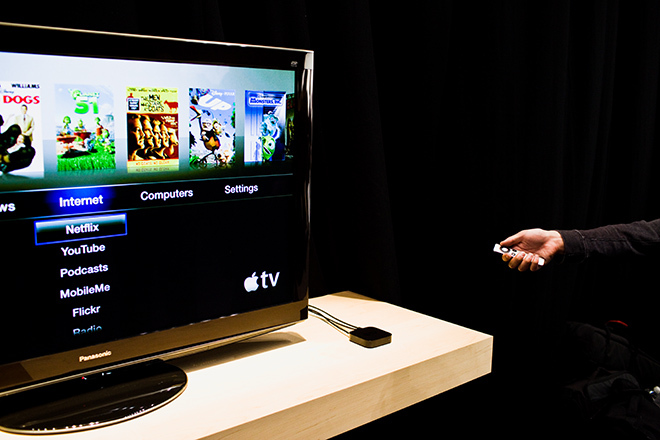 Apple joins an increasingly crowded and risky scrum of companies trying to reinvent television for the internet age. Netflix and Hulu both have been offering streaming video playback of movies and TV shows, with some success, for over a year. Google is working on a set-top box that would blur the line between TV and internet fare, YouTube is said to be planning mainstream film rentals and Amazon is rumored to be planning its own Netflix-like video streaming service. But the real threat are the cable companies and TV networks, which have a lock on the shows that people want to watch — and so far, there’s been little incentive for them to open up their tightly-controlled ecosystems to internet upstarts. Apple’s play is for convenience, but it’s not the cross-platform strategy needed for dominance, wrote Andrew Eisner, a director at online electronics retailer Retrevo.com. The company will also be providing a feature within iOS 4.2 that customers can use to share videos wirelessly from their iPhones, iPod Touches or iPads. Called “AirPlay,” the feature will let customers display a video from their mobile device, on an Apple TV-connected TV screen, with a single tap. IOS 4.2 won’t be available until November. In an implicit acknowledgment of Apple TV’s poor sales to date, Jobs again referred to the product as the company’s “hobby.” He showed the new Apple TV at a press conference here on Wednesday. But Jobs was careful to cast the company’s previous product as a learning experience, and indicated his intention of throwing more of the company’s weight behind the upgraded Apple TV. Apple TV customers will be able to rent first-run HD movies for $5, at the same time as they’re released on DVD. That’s a substantial improvement from the past, when there were significant time lags before movies were available through iTunes. Customers will also be able to rent HD TV shows from ABC and Fox for $1, a discount from the previous price of $3. The shows will run without commercial interruption. Netflix customers will also be able to stream video from Netflix via Apple TV, and can also use the device to browse and view YouTube videos and content uploaded to Apple’s MobileMe service. Customers can also stream content from their computers, including photos, videos and music, with no syncing required. Apple is already accepting pre-orders for the new Apple TV on its site. For full coverage of Apple’s press conference, see Wired.com’s live blog of the event. Originally published on Wired, September 1, 2010.